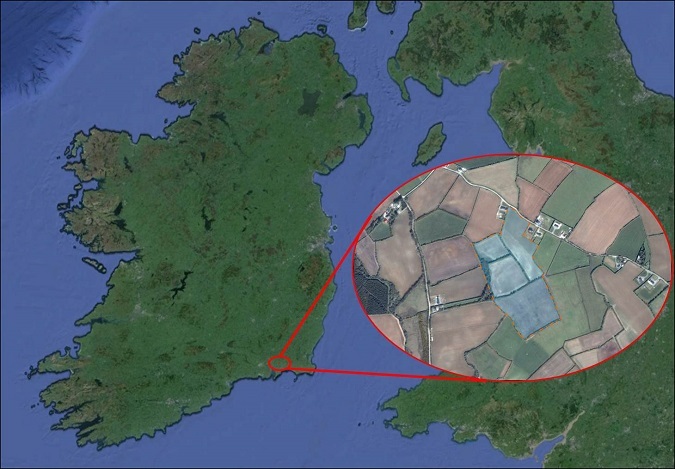 During the planning stages of the Republic of Ireland’s first large scale solar park at Coolroe, County Wexford, concerns were raised over potential glint and glare impacts. Specifically, potential solar reflections towards nearby dwellings and roads were considered an issue. In order to address any potential issues, Wexford Solar Limited commissioned Pager Power to undertake a full Glint and Glare Assessment for the development. Pager Power’s results assisted in addressing the concerns and allowing the project to gain planning permission. There was also an oral hearing for the project, held by An Bord Pleanála – Ireland’s independent planning board. Pager Power attended the hearing to explain the glint and glare investigation, and to answer questions from local residents. The project was fully consented following the hearing in the summer of 2015. The 5 Mega-Watt (MW) solar park is to be the first development of its kind in the Republic of Ireland. The solar park is a joint development between Wexford Solar and a local landowner. It is to be located in County Wexford, Republic of Ireland. The site location is shown in the figure below. Pager Power was commissioned to undertake a study regarding glint and glare impacts in order to address any potential issues. 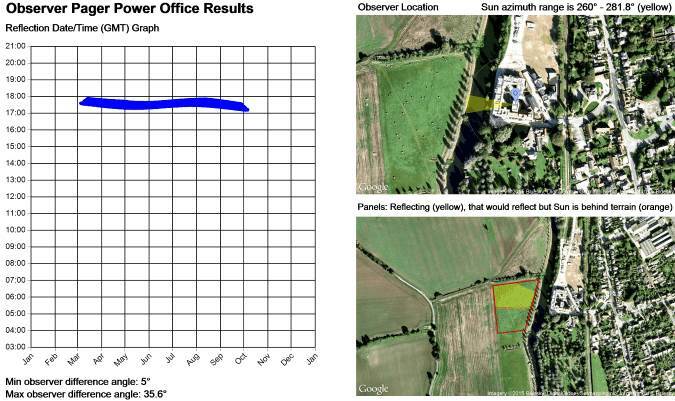 This was our first solar Glint and Glare Assessment in the Republic of Ireland. Because large-scale solar developments were so new to the country, there was no detailed guidance pertaining to glint and glare concerns. Similarly, since this was the first development of its kind, local residents and the planning authorities alike had to be cautious with regard to potential effects. The first step was to identify potential receptors of glint and glare. This was done by inspecting maps and imagery of the region to identify residential properties and road user locations where a potential view of the solar farm could exist. In total, 36 dwelling locations and 27 road user locations were selected for assessment. Figure 2 shows a sample Glint and Glare Chart, unrelated to the Coolroe site, for reference purpose. This is one of multiple technical outputs from Pager Power’s bespoke model. The effect of screening in the form of existing or proposed hedgerows and vegetation was then considered. The assessment demonstrated that the majority of receptors in the area would be completely unaffected by glint and glare. It was shown that panels in the northern portion of the development area could produce reflections towards a small number of receptors under particular conditions. Consideration of the effects in the context of the available studies showed that the issues were not significant. The Pager Power results were part of the planning application that was accepted by the local planning authority. This development was to be the first of its kind in Ireland, and an oral hearing was held by An Bord Pleanála in order to gain a comprehensive understanding of appeals to the permission. Pager Power attended the hearing and presented the results of the Glint and Glare Assessment in May of 2015. The project was subsequently consented. Image accreditation: “Solar Farm” by Michael Mees / CC BY 2.0 / Image cropped and resized from original. Figure 1 created with images sourced from Google Earth, © 2016 Google.